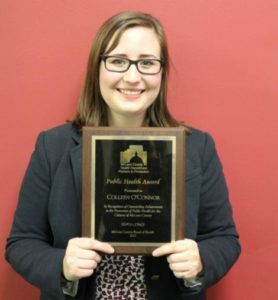 Congratulations to Project Oz Prevention Specialist, Colleen O’Connor, CPS, CADC, who was awarded the 2017 McLean County Public Health Award by the McLean County Board of Health last week. Last year Colleen started a school-based prevention program that has reached more than 2,000 students at nine schools. The health department says the program has referred dozens of students to other support services as a result of the program, some of them with depression and suicide attempts. Here is WGLT’s full article. This entry was posted in News, Prevention and tagged depression, mental health, prevention, suicide, teen. Bookmark the permalink. Both comments and trackbacks are currently closed.